Advances in information and communication technologies (ICTs) provide new opportunities for mentoring, eliminating the need for a synchronous meeting. We report the findings of a survey that measured university student perceptions of the roles and expectations of online mentors and the likelihood of using an online mentor if given the opportunity. Nearly two-thirds of students would accept an online mentor if given the opportunity, with sophomores and juniors, females, communication online with familiar persons, and the importance attached to a mentor as a model positively related to choosing an e-mentor. Recommendations for e-mentoring programs are given. Switzer, J. & Switzer, R. (2015). Student Attitudes And Preferences Toward An E-Mentoring Program: A Survey of Journalism Students. 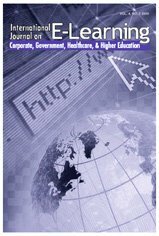 International Journal on E-Learning, 14 (1), 97-112. Waynesville, NC USA: Association for the Advancement of Computing in Education (AACE). Retrieved April 24, 2019 from https://www.learntechlib.org/primary/p/40622/. Allen, T.D., Eby, L.T., & Lentz, E. (2006). The relationship between formal mentoring program characteristics and perceived program effectiveness. Personnel Psychology, (59)1, 125-153. Appel, M. & Trail, T. (1986). Building effective professional adult education mentoring relationships. Mentoring: Aid to Excellence, 1. Beyene, T., Anglin, M., Sanchez, W., & Ballou, M. (2002). Mentoring and relational mutuality: Protégé perspectives. Journal of Humanistic Counseling Education and Development, 41, 87-102. Bierema, L.L. (1996). How executive women learn corporate culture. Human Resource and Development Quarterly, 7, 145-164. Bierema, L., & Merriam, S. (2002). E-mentoring: Using computer mediated communication to enhance the mentoring process. Innovative Higher Education, 26(3), 211227. Blackwell, J.E. (1989). Mentoring: An action strategy for increasing minority faculty. Academe, 75, 8-14. Bonnett, C., Wildemuth, B.M., & Sonnenwald, D.H. (2006). Interactivity between protégés and scientists in an electronic mentoring program. Instructional Science, 34(1), 2461. Bruce, M.A. (1995). Mentoring women in doctoral students: What counselor educators and supervisors can do. Counselor Education and Supervision, 35(2), 139-149. Buell, C. (2004). Models of mentoring in communication. Communication Education, 53(1), 56-73. Burke, R.J. (1984). Mentors in organizations. Group and Organizational Studies, 9, 353372. Chan, C.C., & Ho, W.C. (2008) An ecological framework for evaluating relationship-functional aspects of youth mentoring. Journal of Applied Social Psychology, 38, 837867. Crisp, G. (2009). Conceptualization and initial validation of the college student mentoring scale (CSMS). Journal of College Student Development, 50(2), 177–194. Darling, L. (1986). The mentoring mosaic: A new theory of mentoring. In W. Gray& M.M. Gray (Eds) Mentoring: Aid to excellence in career development. Vancouver, BC: International Association for Mentoring. DeAngelo, L. (2013). Programs and practices that retain students from the first to the second year: Results from a national study. In R.D. Padgett (Ed. ), The first-year experience: New directions for institutional research. San Francisco, CA: JosseyBass. DiRenzo, M.S., Linnehan, F., Shao, P., & Rosenberg, W.L. (2010). A moderated mediation model of e-mentoring. Journal of Vocational Behavior, 76, 292-305. Ensher, E., Heun, C., & Blanchard, A. (2003). Online mentoring and computer-mediated communication: new directions in research Journal of Vocational Behavior, 63, 264-288.Erkut, S., & Mokros, J.R. (1984). Professors as models and mentors for college students. American Educational Research Journal, 21, 399-417. Fagenson, E.A. (1989). The mentor advantage: Perceived career/job experiences of protégés versus non-protégés. Journal of Organizational Behavior, 10, 309-320. Freedman, M. (1992). The kindness of strangers: Reflections on the mentoring movement. Philadelphia: Public/Private Ventures. Fuentes, M., alvarado, A.R., Berdan, J., DeAngelo, L. (2014). Mentorship matters: Does early faculty contact lead to quality faculty interaction? Research in Higher Education, 55(3), 289-307. Gergen, K.J. (1978). Toward generative theory. Journal of Personality and Social Psychology, 36, 1344-1360. Girves, J.E., Zepeda, Y., & Gwathmey, J.K. (2005). Mentoring in a post-affirmative action world. Journal of Social Sciences, 61(3), 1540–4560. Haney, A. (1997). The role of mentorship in the workplace. In M.C. Taylor (Ed. ), Workplace Education (pp. 211-228). Toronto, Ontario: Culture Concepts. Haring, M.J. (1999). The role of mentorship in the workplace. In M.C. Taylor (Ed), Workplace Education (pp. 211-228). Toronto Ontario: Culture Concepts. Harris, S. (2002). Student perceptions of the mentoring relationship in higher education. In F.K. Kochan (Ed. ), The organizational and human dimensions of successful mentoring programs and relationships. A volume in: Perspectives in mentoring (pp. 5368). Homitz, D.J., & Berge, Z.L. (2008). Using e-mentoring to sustain distance training and education. The Learning Organization, 15(4), 326-335. Hughes, M.S. (1988). Developing leadership potential for minority women. In M.A.D. Sagaria (Ed. ), Empowering women: Leadership development strategies on campus. New directions for student services: No. 44 (pp. 63-75). San Francisco: JosseyBass. Jacobi, M. (1991). Mentoring and undergraduate academic success: A literature review. Review of Education Research, 61(4), 505-532. Jennings, A. (2010). Technical communication practitioner-student interaction: An opportunity for students to learn from the practitioners’ world of work. Technical Communication, 59(4), 324-333. Johnson, C.S. (1989). Mentoring programs. In M.L. Upcraft & J. Gardener (Eds. ), The freshman year experience: Helping students survive and succeed in college (pp. 118-128). San Francisco: Jossey-Bass. Kanter, R.M. (1977). Men and women of the corporation. New York: Basic. Kasprisin, C., Single, P., Single, R., & Muller, C. (2003). Building a better bridge: testing e-training to improve e-mentoring programmes in higher education. Mentoring and Tutoring, 11(1), 67-78. Kasprisin, C., Single, P., Single, R., Ferrier, J. & Muller, C. (2008). Improved mentor satisfaction: Emphazising protégé training for adult-age mentoring dyads. Mentoring and Tutoring, 16(2), 163-174. Kendricks, K.D., Nedunuri, K.V., & Arment, A.R. (2013). Minority student perceptions of the impact of mentoring to enhance academic performance in STEM disciplines. Journal of STEM Education, 14(2), 38-46. Kimball, L., & Eunice, A. (1999). Zen and the art of facilitating virtual learning communities. Paper presented at the Thinkquest Teachers’ Summit, Los Angeles. Kirk, J., & Olinger, J. (2003). From traditional to virtual mentoring. Western Carolina University. (ERIC Document Reproduction Services No. ED 475467). Knouse, S. (2001). Virtual mentors: Mentoring on the Internet. Journal of Employment Counseling, 38, 162-169. Kram, K.E. (1988). Mentoring at work: Developmental relationships in organizational life. Lanham, MD: University Press. Lester, V., & Johnson, C. (1981). The learning dialogue: Mentoring. In J. Fried (Ed. ), Education for student development. New directions for student services: No. 15 (pp. 49-56). San Francisco: Jossey-Bass. Levenison, D.J., Carrow, C.N., Klein, E.B., Levenison, M.H., & McKee, B. (1978). The seasons of a man’s life. New York: Ballentine. McLaughlin, C. (2010). Mentoring: What is it? How do we do it and how do we get more of it? Health Services Research, 45(3), 871-884. Mee-Lee, L. & Bush, T. (2003). Student mentoring in higher education: Hong Kong Baptist University. Mentoring and Tutoring, 11(3). 263-271. Moore, K.M., & Amey, M.J. (1988). Some faculty leaders are born women. In M.A.D. Sagaria (Ed. ), Empowering women: Leadership development strategies on campus. New directions for student services: No. 44 (pp. 39-50). San Francisco: JosseyBass. Moses, Y.T. (1989). Black women in academe: Issues and strategies. Washington, DC Association of American Colleges. (ERIC Document Reproduction Service No. ED311817). Moss, P., & Debres, J.K. (1999). Toward mentoring as a Feminist praxis: Strategies for others and ourselves. Journal of Geography in Higher Education, 23, 413-427. Mueller, S. (2004). Electronic mentoring as an example for the use of information and communications technology in engineering education. European Journal of Engineering Education, 29(1), 53-63. Muller, C.B. (2010). Understanding e-mentoring in organizations. Adult Learning, 20I1-2), 25-30. Nieva, V.F. & Gutek, B.A. (1981). Women in work: A psychological perspective. New York: Praeger. Pascarella, E.T., & Terenzini, P.T. (2005). How college affects students. San Francisco: Jossey-Bass. Penny, C., & Bolton, D. (2011). Evaluating the outcomes of an e-mentoring program. Journal of Educational Technology Systems, 39(1), 17-30. Philips-Jones, L. (1982). Mentors and protégés. New York: Arbor House. Phinney, J.S., Campos, C.M., Kallemeyn, D.M., & Kim, C. (2011). Processes and outcomes of a mentoring program for Latino college freshmen. Journal of Social Issues, 67(3), 599-621. Riley, S., & Wrench, D. (1985). Mentoring among women lawyers. Journal of Applied Social Psychology, 15, 374-386. Risquez, A., & Sanchez-Garcia, M. (2012). The jury is still out: Psychoemotional support in peer e-mentoring for transition to university. Internet and Higher Education, 15, 213-221. Roche, G.R. (1979). Much ado about mentors. Harvard Business Review, 57, 14-16, 20, 24, 26-28. Ross-Thomas, E., & Bryant, C.E. (1994). Mentoring in higher education: A description case study. Education, 115(1), 70-76. Schmidt, J.A. & Wolfe, J.S. (1980). The mentor partnership: Discovery of professionalism. NASPA Journal, 17, 45-51. Shea, G.F. (1992). Mentoring: A guide to the basis. CA: Crisp Publication. Single, P.B., & Muller, C.B. (1999). Electronic mentoring: Issues to advance research and practice. Paper presented at the International Mentoring Association Conference, Atlanta, GA. Smith, K.Z. Mentoring is the key to ending classroom versus newsroom debate. Quill, 98(4), 3. Stone, F. (2004). The mentoring advantage: Creating the next generation of leaders. Chicago: Dearborn Trade Publishing. Stowers, R.H., & Barker, R.T. (2010). The coaching and mentoring process: The obvious knowledge and skill set for organizational communication professors. The Journal of Technical Writing and Communication, 40(3), 363-371. Waldeck, J., Orrego, V., Plax, T., & Kearney, P. (1997). Graduate student/faculty mentoring relationships: Who gets mentored, how it happens, and to what end. Communication Quarterly, 45(3), 93-109. Wallace, D., Abel, R., & Ropers-Huilman, B. (2000). Clearing a path to success: Deconstructing borders through undergraduate mentoring. The Review of Higher Education, 24(1), 87–102. Walther, J.B. (2013). Groups and computer-mediated communication. In Y. AmichaiHamburger (Ed. ), The social net: Understanding our online behavior (pp. 165-179). Wilde, J.B. & Schau, C.G. (1991). Mentoring in graduate schools of education: Mentee’s perceptions. Journal of Experimental Education, 56, 165-179. Zey, M.G. (1984). The mentor connection. Homewood, IL: Dow Jones-Irwin.